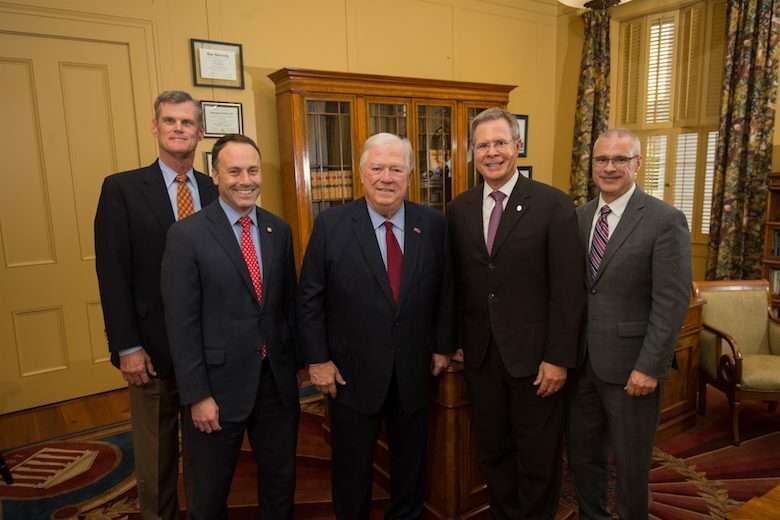 The University of Mississippi soon will be home to a bipartisan center named after alumnus Haley Barbour, a major architect of national politics who served two terms as governor of Mississippi. On Thursday (Oct. 18), the Mississippi Institutions of Higher Learning approved the creation of the Haley Barbour Center for the Study of American Politics, which will be part of the Department of Political Science. The center will focus on the study of American campaigns and elections, and its first class will be taught in the upcoming winter term. Barbour, who holds a Juris Doctor from the university, said he is honored to have a second center at his alma mater named after him, in addition to the Haley Barbour Center for Manufacturing Excellence. The Center for the Study of American Politics will be designed to attract students who will enter many fields and will provide opportunities to learn about American politics and civic responsibility through classes, work with advocacy groups and internships, he said. The Barbour Center will draw from the faculty of the Department of Political Science, College of Liberal Arts and the rest of the university, as well as connections to those working in politics. The goal is to eventually have a dedicated space on campus, and the IHL board has also approved the university’s plan to create a department chair for the center. Students will participate in a range of topics and experiences to prepare them for engagement in the American electoral process as citizens or as political party activists, paid campaign advisers or electoral process managers. The Barbour Center’s mission will be two-pronged. The first focus will be academic, including an endowed chair and a series of courses to advance students’ knowledge and interest in campaigns and elections. A second focus will be on outreach, including bringing high-profile speakers to campus as well as hosting national conferences and summer outreach programming. The center will also provide some funding for graduate students. The Department of Political Science has seen an increase in majors, which is counter to national trends where majors in this field are on the decline, said Lee M. Cohen, dean of the College of Liberal Arts. He believes the addition of this center will lead to even more interest. “The current climate of American politics suggests the need for young people to engage in the election process and be prepared for the reasoned, respectful political debate that supports a healthy democracy,” Cohen said. “He started working in national politics his last year as an undergraduate, and has pretty much never left,” Bruce said. “His two most prominent roles have been as chair of the Republican National Committee, and as a two-term governor of the state of Mississippi. In both of those roles, he is credited with successful records. Barbour began his life in politics in 1968, when he went to work as a field organizer on Richard Nixon’s presidential campaign. From 1973 to 1976, he was executive director of the Mississippi Republican Party. Presidents Gerald Ford, George H.W. Bush and Ronald Reagan were among the many Republican candidates who received his advice. He also served as political director of the Reagan White House and cofounded BGR Group, a prominent Washington government affairs firm. From 1993 to ’97, Barbour served as chairman of the Republican National Committee and managed the “Republican wave” in 1994, which led to Republican control of both the Senate and House of Representatives. In 2004, Barbour took office as Mississippi’s 63rd governor. The following year, after Hurricane Katrina hit the Gulf Coast, he earned national recognition for his quick and decisive response to the disaster. In 2015, Barbour’s memoir was published. “America’s Great Storm: Leading through Hurricane Katrina” gave his perspective on leadership lessons that came from the storm. The department’s alumni advisory board first raised the idea of creating an endowed faculty chair named after Barbour. The board and the former governor came together to design the center in a way that benefits students, faculty and the university. The center will be funded by private donors and external funding grants. So far, the Governor Haley Barbour Endowment for the Study of American Politics has raised almost $1.5 million. Plans are in place to pursue additional funding from individuals, corporations and foundations, as well as state and federal grants. Barbour said one great long-term benefit of the center is that it will promote a more engaged citizenry and inspire students to take an active role in their government for generations to come.